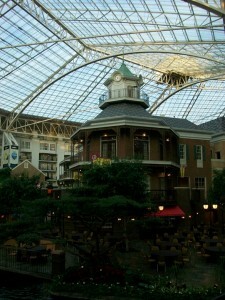 Earlier this year I attended the Blissdom 2011 conference at the Gaylord Opryland Hotel in Nashville, TN. Although I’ve been on the hotel grounds previously it was only for a dinner cruise on the General Lee years ago. I’d never been inside the building. That means I can’t compare how the property was pre-renovation after the 2010 flooding. 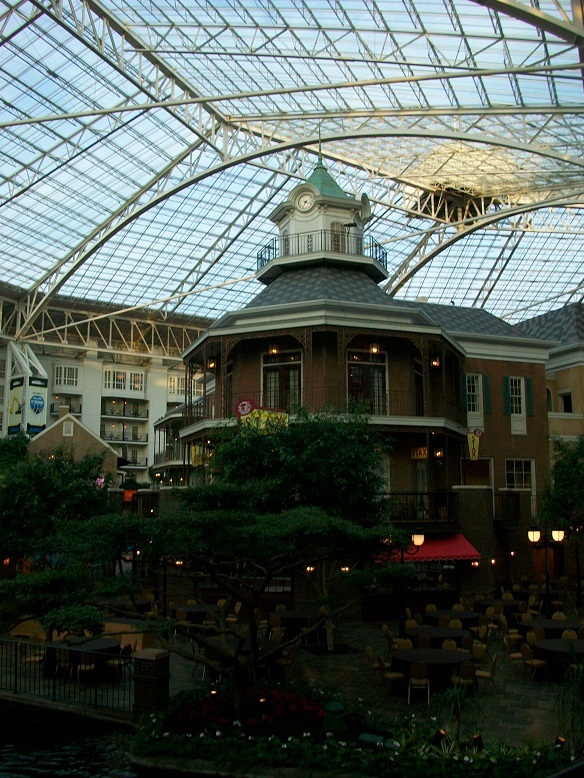 The hotel is impressive looking from the outside and you can see the property is quite large. The registration lobby was enormous so I can imagine it gets busy at times although I was able to walk right up to a clerk and check in. They print out a map with directions on how to find your room, but it didn’t keep me from getting lost as I moved through two biodomes to get there. I was probably gawking at the boat ride or various shops and restaurants tucked away in corners. Fortunately, staff walking about their business stop and checked if I needed help. I was taken to the right elevator with a smile and polite chitchat. I reserved a standard room, but in addition to suites you can get a room with a balcony overlooking the garden area which would have been a unique experience. I’m just starting to create vlogs so check out the room tour in this video. I didn’t notice anything special about the conference spaces except that I was only able to use Wi-Fi effectively at one session. I don’t think the areas was able to handle the volume of bloggers logging on. There are restaurant/night club venues close to the conference space that were utilized for evening events quite successfully. I really enjoyed getting to see other venues and get out of the conference room setting. The hotel runs their own shuttle service from the airport every 20 minutes during the day and evening hours. There’s a kiosk that’s right downstairs from baggage claim where you can buy either one way or round trip tickets. Both the shuttle driver and the ticket agent were friendly and effective in setting a good impression. This excellent level of service continued throughout my three night stay. When I checked out extra early to catch a 5:30 a.m. flight it turned out to be too early for the shuttle service. The front desk agent gave me a voucher that paid for a taxi to the airport. That gesture was above and beyond. This is a hotel I would love to stay at again with family members — I still need to take the boat ride through the property. Is that a single serve coffee maker? I hate those! I like to bring filters and extra coffee and just make enough for the am in the room. A single cup is not enough! Then, I have to buy coffee – and I’m cheap, so that doesn’t make me happy at all. Yes, it was a single serve coffee maker. They’re okay for just me but I dislike them when there are two people in the room. Fortunately, the conference had lots of coffee! I love staying in hotels. Nice video! I love when hotel service goes above and beyond. Thanks for sharing your review. Would love to make it to Blissdom sometime soon. Great place to go to for a conference. Thank you for the video. I will be looking forward to go to that place if I have an appointment. I would go for balcony overlooking the garden area since I love the cozy smell and look over the garden.